Coriander Hobie is the daughter of an adoring mother and father who lives an early life of luxury and balance. The love between her parents is ethereal and romantic. Their days are filled with the beaming rays of a bright sun… until a long, dark shadow is cast beginning with the death of her mother. And from there, it seems, all the joy in the world is snuffed out for our young heroine. 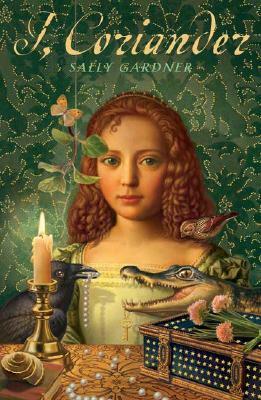 Puritans, fairies, alligators, witches, and death lurk in all corners of this captivating young adult fiction. Once you pick it up, like a fairy’s cruel trick, you won’t be able to put it down! This is a novel I have read time and time again for it’s beauty and fearless delivery. Embrace your dormant imagination as you are whisked away to the 1640’s – a time where magic and religion clashed with fierce results. I’ll admit, the cover art is what put the book in my basket while I was shopping and I’m shameless in my confession. It’s beautiful and oh so very fitting for what’s written on the pages between the covers. You will feel sorrow and joy, pain and anger, frustration and doubt. You will know the wrath of a liberated soul lashing out against the injustice of a preacher and be doubly thankful you live in the era in which you do. You will cry foul at the rotten teeth of a heartless step mother and be held captive in tender moments of friendship. This is a great novel for young and old, boys and girls. Coriander is built strong and defiant, cunning and curious. Her statement alone, “I, Coriander,” shows the value of her character – once you get to that part in the book, you’ll know what I mean. Add a little magic to your life and take this novel home. You’ll be peeking around corners searching for magic creatures in no time!